As our company grew from a 2 person start-up to a 450 person company, we bought many enterprise systems. Tapping our personal network for insights on systems was a good start but had limitations. It was often difficult to find people who had used the same system in a similar context. Trusting vendors’ sales representatives also proved problematic. In one instance, we bought an expensive HR system, only to find that key features promised by the sales representative did not work as required, rendering the product useless in our context. The poor implementation and customer service experience also never surfaced in interviews with vendor supplied customer references. Coincidentally, this HR product was rated highly by a leading technology analyst because of the vendor’s strong market presence. A common practice in the enterprise software industry is to “spin” a presentation to highlight a product’s best features and avoid disclosing its weaknesses. Demonstrations are framed to make products seem easier to use than they truly are. Questions about capabilities and features generally receive an unqualified “yes” versus a more truthful “it depends”. Vendor supplied customer references are only offered up late in the sales cycle and are frequently carefully prepped to say the right things. The world is however changing as more and more software is sold as “a service”, and a company’s reputation can spread rapidly through social media. As a “SAAS” or software as a service business, fees are not paid up front, but rather earned over time. If a sales representative ‘over sells’ your product, it comes back to haunt the vendor in the form of customer churn, poor profitability, and negative references – all of which can significantly curb growth. As the founder of a SAAS company, I strived to be candid about our product’s strengths and weaknesses, sometimes to the chagrin of some of our sales reps. Embracing transparency served us well, allowing us to establish a mostly positive reputation within our sector. 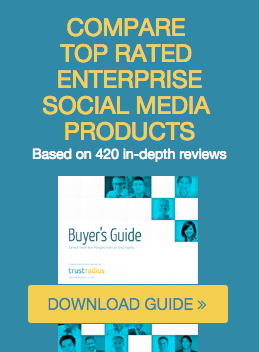 If a pizza joint gets 1000 reviews, why shouldn't an enterprise product have some? Many pundits talk about the “consumerization of the enterprise”. While it often refers to the use of social media or mobile devices in the enterprise, I believe it’s really more a shift towards consumer like experiences within the enterprise, coupled with business users driving the adoption of technology. As consumers, most of us rely heavily on peer reviews for many of the decisions we make - which restaurant to eat at, which movie to see, which hotel to stay at, which appliance to buy, which home contractor to hire. In my home town of Austin, one of the more popular pizza joints has over 1000 reviews. Yet, equivalent peer reviews are generally not available to aid critical business decisions like selecting enterprise technology. Armed with these realizations, I started to talk to IT and business professionals about their software purchase and usage experiences. I learned that my experiences as a buyer of technology were not unique. I heard a strong desire for pragmatic insights from peers. Many software vendors also share my viewpoint that embracing transparency is the best long-run business strategy and frankly inevitable. From these insights, TrustRadius was born. I think the idea has legs. I am also running a startup and it was very frustrating trying to find a CRM solution that would fit our needs and budget. In the end we went with Zoho. Let me know when I can post a review on it! Great post Vinay! And this is why TrustRadius has such an interesting future I think. I agree that expert objective reviews and candid assessment are sorely needed in the technology/digital arena. And I love that phrase "embracing transparency". Interestingly through the exposure I've had with mid/general market customers, I've noticed how quickly they latch on to the fact that I'm not a software specialist but a digital generalist. And that I'm not coming with a system to sell, but am objective and dispassionate about what constitutes best practice. Consultancy has so much potential value when it's product or platform agnostic. Thank you James and Rakesh for your comments. James - we welcome the participation of objective consultants in our beta. As a policy we do not let people review their own products, or products that they resell. Rakesh - we'd welcome your participation in writing a review of Zoho CRM.